The Deep Denim Stash has been excavated. I have cast on my Calligraphy Cardigan for real, in the darkest shade of Rowan Denim, which is called Nashville. My knitting needles are blue. My cable needle is blue. I’m deliriously happy. Only 8 rows done in these photos, so the oval of the Calligraphy cable is just starting to open. Having worked through the chart for my swatch, it feels like an old friend. All the symbols make sense, and I’m a happy blue knitter. On the right: a sample square for the Picket Fence afghan, also in Rowan Denim. The darker shade in the blanket square is the color my Calligraphy Cardigan will be after its first washing: a warmer, softer blue that will continue to fade with washing and wear. A note on the yarn: Rowan Denim, also called Rowan Original Denim, is the yarn I’m using for my Calligraphy Cardigan. 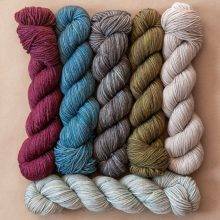 This yarn recently was discontinued, but Rowan carried it for decades, so there is a lot of stock still out there, if you look around. In other denim news, Rowan recently introduced a new yarn, Denim Revive, made from recycled cotton fibers. Needless to say, as a fan of Rowan and lover of any yarn with the word “denim” in the name, I will be checking out Denim Revive. I am intrigued by the look of it, by the patterns designed for it by Martin Storey, and by the expanded (beyond blue) color palette. However, Denim Revive is not a substitute for the original Rowan Denim, in that it’s not intended to shrink or fade. Both these qualities are special to me and other denim-lovers. We shall soldier on, with just the slightest quiver of the lower lip. 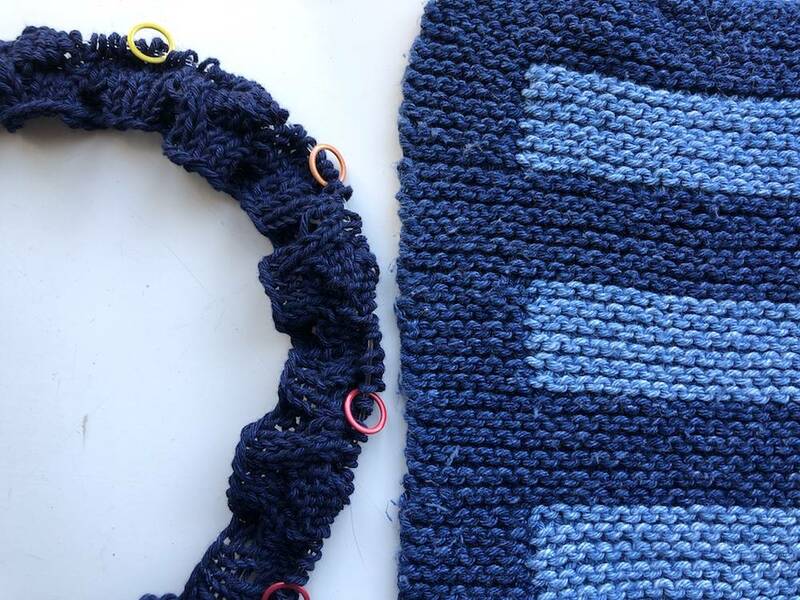 And now, for two small tips that enhance my cable-knitting experience. Due to the knitting bag-friendly trim size of the MDK Field Guides, the charts in the print edition are—how to put this?—petite. Enlarging the chart is a kindness for the eyes, especially if you knit at night in the glow of the TV. I don’t follow my own tip, though. I’ve got a heavy magnifying paperweight (it came with a dictionary) that I just plop on top of any part of the chart that is uncertain to the naked eye. But using a magnifier is really just a non-digital method of chart enlargement. So: enlarge the chart. Your eyes and brain will thank you. It’s a mood-lifter. Highlighter tape is an office supply that is so helpful to knitters that my LYS, Knitty City, has it up on the pegboard tool wall with the Chibis and the stitch markers. I stick a piece of highlighter tape right under under the row I’m working. I left blue fingerprints on my highlighter tape. This saves a lot of squinting and re-orienting myself to my place in the chart. Highlighter tape unsticks and resticks very easily, like a Post-it note, so you can keep repositioning the tape as you work your way up the rows of the chart. Ann, I know you use an actual Post-it note to mark your place in a cable chart. This appeals to my frugality: use what you have on hand. A multi-purpose office supply is better than a single-purpose office supply! So, a Post-it is great, and certainly better than using a ruler that slides around, or nothing at all, to keep your place. But if you have some highlighter tape, its transparency is nice. You can see what has gone before, which reinforces your sense of knowing where the heck you are. One roll of highlighter tape (from Lee Products Co., billed as “A Removable Alternative to Highlighter Pens”) has 393 inches of tape in it. That should last me a good long while even if the piece I am using loses its stickiness. I keep the roll of tape in my knitting tool kit, because I only use it for knitting, and that way it doesn’t get lost in a desk drawer. So much of life is about knowing where things are. One last tip, that I fear is too obvious but here goes: if you want to know how many stitches are in a cable symbol on the chart, so that you can quickly locate it in the abbreviations guide, just look at the row above the symbol, and count the stitches on the WS row. Example: the big right-leaning cable at the center of row 7 has 9 stitches above it on row 8. Sometimes doing that will avoid the necessity to even look up the symbol. It took me a while to figure that out, so I share it. One of the 9 stitches is a purl, which is what makes life interesting. I would love to hear readers’ tips on working cables and navigating cable charts. Answers on a postcard, or more conveniently, in the comments, please! We're just getting started! Join us and bang out a Norah Gaughan cabled sweater by the end of February. Needles Up: Let’s Bang Out a Revolution! Great tips! I love highlighter tape and have at least 5 rolls of in but for some reason cannot currently locate a single one. I still haven’t forgiven Rowan for discontinuing Calmer . . . and now Denim! 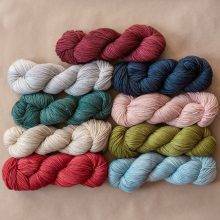 But I’m slightly mollified by the existence of Softyak DK, which I am using to bang out my sweater. Calmer was such a great yarn! Rowan Calmer! I’m still not over that one. I loved that yarn and still have a precious little stash of it. Rowan and Ben and Jerry’s. they discontinue without a thought of what I think about it, RIP calmer and low fat frozen yogurt cookie dough! 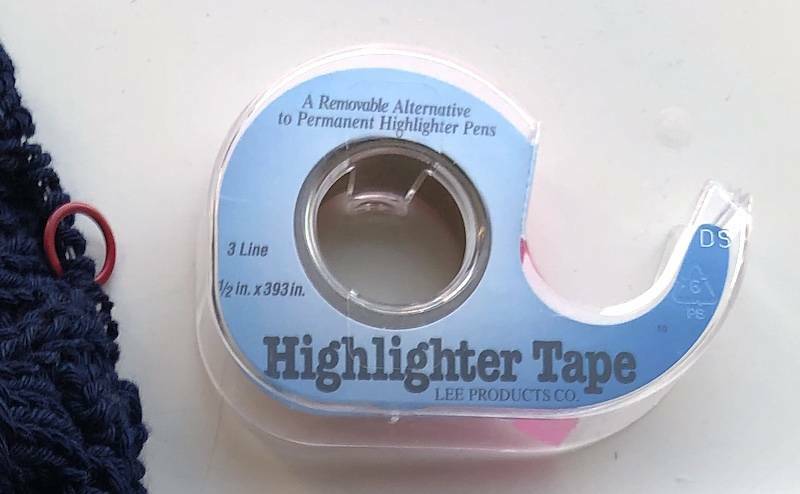 I never heard of highlighter tape but now that I know,I am going to get some. Great tip, thanks. Before I continue knitting after finishing a cable, I go back and tighten up the stitches because my gauge when cabling is looser than my regular knitting. I have a love hate with charts- maybe it’s that my eyes alone think they’re in their late 90’s… granny vision aside- if my chart is hard to read and I haven’t planned ahead to enlarge (because sometimes a cable project is started on the road ) and the chart isn’t too crazy- I’ll simply write it out- big! I do that too! Makes it MUCH easier for me while knitting, plus it gives me that first complete read-thru of the pattern. Finding the cables challenging but doable. Gave up on the chart and follow the written instructions! Have tried following them side by side? Read the written and then compare it to the chart. That’s how I learned the language of charts. Happy knitting! There’s a tutorial on reading cable chart in A Year of Techniques. I compulsively count each repeat on the wrong side rows–particularly on the increase rows. Helps me be sure I haven’t missed a yarn over and I gain a familiarity with the landscape of knits and purls that make up the cables. Yes, and a great mistake catcher in lace work. Me,too! It’s a great way to check. I will count each repeat as I finish it so I don’t have to undo a row, especially with fiddly knit-togethers or cables. I’m with Ann on the Post-it, I can jot essential stuff on it, like the grocery list. And any “design features” that may have occurred as I knit. And I place it so the rows yet to be worked are covered, so I can see what was under the current row. I find that this helps me learn the pattern. I use a Post-It note the same way. Started doing this working stranded colorwork! Hahaha I call it, ooo squirrel!! I’m a charts only gal and huge fan of highlighter tape. My single roll has lasted years (results may vary!). Alas, I never had the joy of knitting with Rowan Denim, but I will check out the new offering. Thanks for the link! Try putting the row guide of your choice above the current chart row. Then what is to come is not a distraction. Also if a pattern chart is copied or enlarged for each project there is less wear on the original printed pattern. Well loved pattern books earn their tatters and are easy to spot in a pile but each sticky tape or post-it shift removes print. Knit that pattern more than once and the chart will be a bit faded. Use a chart on something for a few grandkids and it will require a good light to read it when you want to use it again. Yes, I always put my highlighter tape above the row I’m working on – that seems to work best for me. YMMV. My top tip would be to learn to cable without a cable needle -so you don’t have to try and keep track of the cable needle, which we all know is nigh on impossible! I second this!! Even those 7- and 9-stitch ones are doable without a cable needle. I agree! Knitting cables without a cable needle is the only way to go! I cable without a cable needle also, however, since I use interchangeable needles, I use a smaller size on the left needle (quick change at the end of a row, if knitting back and forth by not using the key to tighten). Makes twisting the cables SOOOOO much easier. Currently I’m using a nine on the right needle and a six on the left on my Karel Cardigan ( https://www.ravelry.com/patterns/library/karel-cardigan ) Thanks to @yarnonthehouse on Instagram for that hint! Game changer, Mary! Thanks to you and YOTH! So clever! Then again not sure I can be trusted to switch the needle tip back at the end of the row. I notice it quickly when I forget. It’s tougher to slide the stitches along. However, if you’re knitting in the round, you never have to switch. Just cabling freedom! Does this change your gauge at all? Sounds like a great tip! Ideally, you’d swatch using this technique to be most accurate, but “in theory” gauge shouldn’t be affected. My fabric looks uniformly better—neater. The gauge, or size of a stitch, is supposed to be determined by the size of the right hand needle, or the needle onto which you slip your completed stitch. Just learned how to do this recently and I wonder why I never learned before. It really speeds up the process! I use colored pencils to color in the trickier symbols in the chart and the key. The color jumps out from the key and makes it easy to quickly identify what’s next. I sometimes color-code all or some of the cables in the chart with a highlighter and of course color-code the chart key as well. In the middle of my current cabled project I purchased a magnetic pattern holder that has strong magnets to hold the pattern in place and a long magnetic strip that can be placed below (or above, depending on your choice) the row I’m working on. It made following the pattern so much easier! And it keeps the pattern clean and unwrinkled. I originally bought a metal pattern holder, with magnetic strips, for my cross-stitch projects. Now I use it for knitting patterns. Magnets stay in place even when I pack everything in my bag. It’s a great tool. I also picked up a music stand, at a yard sale, and use it to hold the board and pattern at eye level. Makes it so much easier to see. I love these tips but to be honest, I’m relying on the written directions and counting to myself as I go along. While I use charts for lace knitting (and these tips will help! ), the written directions are helping me to learn the facets and nuances of the construction of a cable more thoroughly than a chart does. It’s just the way my mind works. To make highlighter tape easier to move, I fold under one end of the tape about 1/2 inch which gives me a little tab. This tab also keeps the end of my highlighter tape from fraying or splitting. This seems like an obsessive detail, but it helps me. And I color my charts and key with colored pencils which saves time in the long run and helps me learn the pattern. Besides, coloring is fun! Yup, I do the same. Englarge chart, color it, use highlighter tape with both ends folded under to give a bit of a tab. Great minds think alike. I do the tab thing with my highlighter tape, too! Before I start working a chart, I go through it with highlighter pens and color code the various symbols to correspond with the legend. For instance, all “/“ might be pink, all “\” yellow, all C3F green, all YO red, etc. This system, along with highlighter tape and learning to cable w/o a cable needle have helped me overcome my original terror of charts…now I love them. I’m a big fan of enlarging the chart. I have one of those magnet boards with the bar that you move up and down. I prop it up directly in front of me on the kitchen table or on a stool I drag in front of the sofa. Something I am learning is that it is easier on my eyes if I look at a chart straight in front of me at the proper height, rather than having it on the sofa next to me and having to look down all of the time. The bar creates a bad shadow (the curse of overhead lights) so I might pick up some highlighter tape at Knitty City and use that in conjunction with the magnet board. A gal I know laminates her charts after she has them edited to her preferences. I teach my students to use colored pencils to lightly color the cable symbol, one color for right leaning cables and a second color for left leaning cables. If they color the center diagonals a little darker than the rest of the symbol it’s easy to see which direction it leans. Also if the stitch after the cable is a purl try wrapping it backwards. It twists the stitch but eliminates that odd loop that can occur. Just knit into the back leg on the wrong side to untwist it. Tips, I love tips—– I use a magnetic board with the magnet strip under the row in progress, with the chart corked up to a 8.5×11 piece of paper, cut down to fit the board. This will be my third project with my Tulip interchangeable needles (gifted from the MDK Shop) and I can’t tell you how it calms me and boosts my confidence to know that those joins won’t pop apart in the middle of a cable! And that they’re fast enough yet grippy enough just make me so happy. Knit on Bangers!!! I think you could do at least two posts just on the tools for this: one on the merits of different sorts of cable needles, and another on markers. Right now, I am with you all in spirit on this one, as i have to many WIPs to start another, but I am planning to learn from everyone so that when it gets to be about April, i will be all the more ready to go. I enlarge a chart AND use post-its because I have a lot of them leftover from office days, but I am going to try your method of placing them above the working row instead of below. What you said about seeing what’s already been knit makes so much sense to me – thank you! 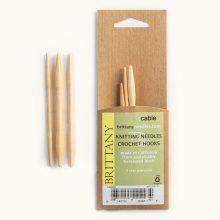 I’ve always used a crochet hook rather than a cable needle, and I’m sticking with it. It’s long enough so stitches don’t fall off. I used to put it behind my ear when not in use, but with age comes spectacles, so now I stick it, hook up, in my yarn cake. I don’t find it to be a nuisance, the way a cable needle can be. I’m with you all on the highlighter tape–I love it. And it never occurred to me to color code charts, so I’ll have to give it a go on something complicated. I’m buying highlighter tape pronto. Kay, wear an apron or all blue clothing while you knit this. I love all of these tips from everyone! I use the highlighter tape to emphasize the rows I am working. On most patterns, it will cover 4-5 rows of the chart, proving a nice little working window. Have to move the tape fewer times, and it’s an incentive to finish the rows the tape is highlighting. Many excellent tips! I take my pattern (enlargement is an excellent idea) and put it in a plastic sheet protector. I really love sleeve protectors for my patterns. You can then use a dry erase marker to mark rows or highlighter tape, etc. The dry erase marks are not permanent but holds up enough for me. I am now using a magnetic board and marker and I like it. Another excellent tool is a music stand for holding your pattern. There is a handy ledge for knitting tools, pencils, extra needles. I am currently using an inexpensive folding one that will fit in my knitting tote for those occasions went I knit outside my house and there is space to set up a music stand. I’m reading all these tips (all great!) but thinking of mine, using a sheet protector. Yay, Ginny! I’m not alone! I can’t believe I don’t know about highlighter tape! Here I am, just using non-transparent Post-it notes. When I use post it notes for chart reading, I actually cover the rows above the row I am working – somehow when I would cover below in a complicated chart, my eyes would wander up and I have mistakenly done stitches from the row above – who knows why I would make such a silly mistake. I found that covering the rows above prevented that, because even if my eyes wandered to the row below my working row, I’d more easily recognize it as one I had already done and I’d quickly re-orient back to my right lane. I’m doing Calligraphy as a pullover, also in Rowan denim. It’s my first time using denim (I loooooooove it!) – everything is blue but utterly washable. I can’t wait for the future shrinking and fading. This is also my longest most complicated cabling effort and it is going slowly for me. I swatched the entire cable beforehand so this second time through is much easier than my first, but I am working slowly. I’ve even employed a couple lifelines, as I found when swatching that frogging a few rows was hard when I would ‘uncable’ any incorrect cables. I’ve probably spent about 4-5 hrs knitting this project, and I’m only on row 20 of the cable pattern. It’s been very enjoyable though! My personal marker of choice – those magnetic book markers, especially the heavy ones that they sell at the Met (on sale, only) … they stay in place; I also made row markers from strips of magnets that you can buy at a craft store, and covered them with some ribbon to prettify them. Though I do have a thing of that tape – Lion Brand Studio sells it, and I do some work nearby. HIGHLIGHTER TAPE. Why had I not heard of this before?? It looks like it works much better than post-its — my post-its always curl up and make it hard to see the row I’m on. Is there a tutorial anywhere on how to knit cables without a cable needle? Lots of tutorials on knitting cables without a cable needle. Try Knit Purl Hunter. Her tutorials are great. I have used all the various methods and like the magnet board and color coding the chart and key the best but my favorite now is Knit Companion. It does all those things for me. It keeps all my patterns in one place, enlarges the chart for me, color codes the stitches and the key, highlights my current row and keeps my place even if my piece is hibernating for months. KC makes lace knitting and complicated charts a breeze. Have been using it about 6 years and wouldn’t want to be without it. I’m not a salesperson for KC, even though I sound like it, just a very satisfied customer. Is this an app, a web site, or what? Sounds GREAT! I’m with you! Wrote my (similar) comment before I saw yours. I don’t work for KC either! Agree – KnitCompanion makes charted knitting a breeze! I mark up my chart and put in row by row written directions. Doesn’t anyone use Knit Companion for their knitting patterns? I’d be lost without it. You can highlight any old thing you want, and keep track of your rows on your charts with highlighters, row counters, etc. I have it on my iPad and just love it. Lol. I guess we were thinking the same thing. Is this from the ap store? Yes. 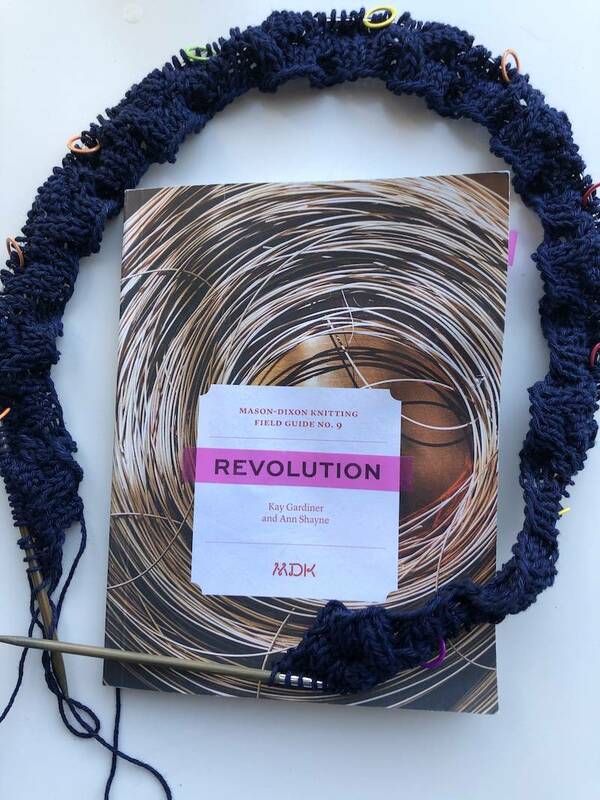 You may want to check out the Knit Companion group on Ravelry. It has lots of info. I use GoodReader. Love it! Highlight, enlarge, scribble…. I can’t imagine knitting without it! Does all of the above, and more! 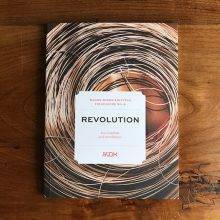 I’ve been using RepliGo Reader. It’s a PDF reader that I use on my Kindle, and it allows me to do all the same things as Knit Companion. I’ll have to see if Knit Companion is available for Kindle, but for those who want something different try RepliGo Reader. This is making me crazy I REALLY HOPE MY DENIM YARN GETS HERE TODAY. I am such a follower when it comes to MDK! 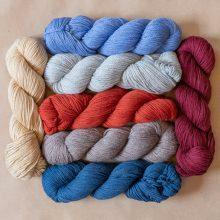 Just found and ordered 20 skeins of Rowan Denim, with plans to make a long-sleeved version of Calligraphy. I had had a lot of it in my stash, due to a warning by Kay several years ago that it was being discontinued. I used much of that last year to make a sweater I LOVE. But it does not have cables, and I can really see how RD is perfect for cables. So, here goes again. And, no, there is no reason to inquire about how many SQs live in my stash. For those who use magnetic boards (found in craft stores in the cross-stitch section)…. Next time you’re on a thrift store adventure, check the “office products” section and see if they have one of the paper pad folders that were mandatory for office dwellers like me in the pre-laptop days. The magnetic board fits perfectly in the slot where the pad of paper used to go. Stick a sheet protector on top for your color-coded, blinged out pattern. At the end of the knitting fest, the pattern is safe in the folder. As much as I love my electronics, I don’t like to travel to knitting groups with an iPad so old school solutions work for me. I cut the paper part off the post it so it’s basically a piece of post it paper tape. Another pro-tip: when you re-knit the project because it was an awesome hat, and the patter has been all mangled and trashed in your bag…treat yourself to a new post it. The old one will have givien up the ghost. Aaaaaaand …. Amber just won the MDK Reduce/Recycle/Reuse Award! My only question is: what do you do with that leftover piece of Post It? If it’s big enough, it becomes a grocery list. If not, it goes in the shredder and is used in my worm bin. .should make the project fly off the needles…. I love my highlighter tape! I put my patterns in document covers, which I think makes the highlighter tape last even longer. In fact, when I finish a project, I usually take the pattern out of the document cover and recycle it (although occasionally I keep it, if I think I’ll be making the pattern again) and leave the highlighter tape on the document cover, ready for the next pattern that will be inserted. I even use it to track directions in non-charted patterns. Denim Revive – Love the recycled idea. It may be a great yarn. However, “it’s not intended to shrink or fade.” So then…why, Rowan, why? We need a denim that shrinks and fades, that you can distress, that you can even splotch with bleach. Knitting with Rowan Denim, and finding the cilour rubs off? have you considered knitting in the buff? True, the colour will stain your skin, bur you’ll resemble early Britons, in their woad period … and you’ll be most welcome on your next visit to England. Knit on, my blue-skinned friends! Yet another great tip from the knitting community… huzzah! I typed that while my eyes were stll dilated, and can see some typos … my apoligies. But, Nekkid Knitting (in the bathroom?) could save your clothes, and your upholstery. Or, I guess you could look for prison jumpsuits? Great tips! I, too, love highlighter tape. I’ve been using it for a number of years. Now you can also find “washi” tape at craft stores. Even places like Target craft section. It’s also a low tack repositional tape. Just choose a solid color if you want to see thru or a fun design. I am not great with charts, they slow me down. I’m doing swirl topper so I wrote out the chart. Took some time, but easier for me. I’m through the cables and about to hit the decrease row. I received recently a roll of highlighter tape in the January Loops surprise pack, never seen it before but started using it on my patterns, game changer!!!! Still waiting on the post to cast on, driving me crazy too…. My knitting challenge for 2019 (so much better than a resolution) is learning to use charts, plus mastering steels. Your advice for highlighter tape or color coding patterns is going to help me quite a bit. Also, I will enlarge the pattern that is currently giving me Agita and work on those charts! I meant to say steeks but Spelchek thought it knew better! I’m all in to the electronic helpers. Keep everything on my iPad and use either Legacy Knit Companion or JKnitHDLIte to track my work. Knit Companion is great for highlighting, annotations, counting, etc., and with the iPad I can enlarge any little detail as I go along. (Very handy for old, tired eyes, especially in the evening!). I have been using the magnetic board to hold the chart and found that I can store my cable needle in the magnets when not in use. I also have the key there and have been following the written directions. Forgot about the highlighter tape. but used it when doing an argyle pattern and it was a lifesaver. My post it notes kept falling off. I mark my cables on the chart as F or B for front or back to quickly let me know where I pick up the slipped stitches from while cabling without a cable needle. It makes my cables fly along as I don’t have to do the mental conversion of which direction the cable leans determines the pick up, nor usually do I have to check the key. A chart is so visual, the rest of the info is readily available – whether you are knitting, purling and how many stitches cross. It saves me many mid-crosses as I mainly knit while multitasking. I also like to colour and use a magnetic board and a magnifying ruler. Everything is blue except your mood! Perfect. You know to fold over the end of your highlighter tape to make a tab, so it’s easy to pick up the strip and move it the next time, right? And if I’m working a chart with a large section of plain stitches, I’ll write the number of stitches on the chart. So I’d write a 9 in those 9 purl sts, and that would also tell you how many sts in your cable. It’s a magnet board (I have the fancy folder one but I also have other sizes, including a small one for travel) and magnetic strips for me. I bought an entire box of them (12 @ 8” long) and they adhere nice and strong over more than one sheet of paper on a board. I don’t remember the cost but they were not expensive. And of course stitch markers for the repeats. Hippo Magnetic Colour Strip on Amazon. Green, Blue, Yellow and Red. Ladies and Gents, I used several of these tips before I was introduced to KnitCompanion. It is available in both free and paid versions for iOS and Android. I will never have to drag around tape, cookie sheets or magnifying glass as long as I have my iPad and iPhone handy. My long-standing guideline for patterns in which there are cable changes in different cables on different rounds or rows is as follows: let’s say I have one cable crossing in a pattern every 6th row, another every 4th, and another every 8th row. I make a bunch of long yarn loops, in a contrasting color to my project yarn, to act as stich markers, and into these loops I tie enough overhand knots, spaced far enough apart, so that there is a number of loops between knots corresponding to the number of rows for that cable repeat. One loop will contain six loops and a “tail” where the cut ends of yarn are, the other will contain four loops between knots, and the other, eight. I slip these onto the needles just before each cable, as you would with a normal stitch marker. Before I knit the cable stitches, I slip the loop corresponding to that row. When I reach the loop containing the tail end, it is time to cable. On the next row, I start over on the other end. To indicate left-or-right cables, I choose different colors of yarn. 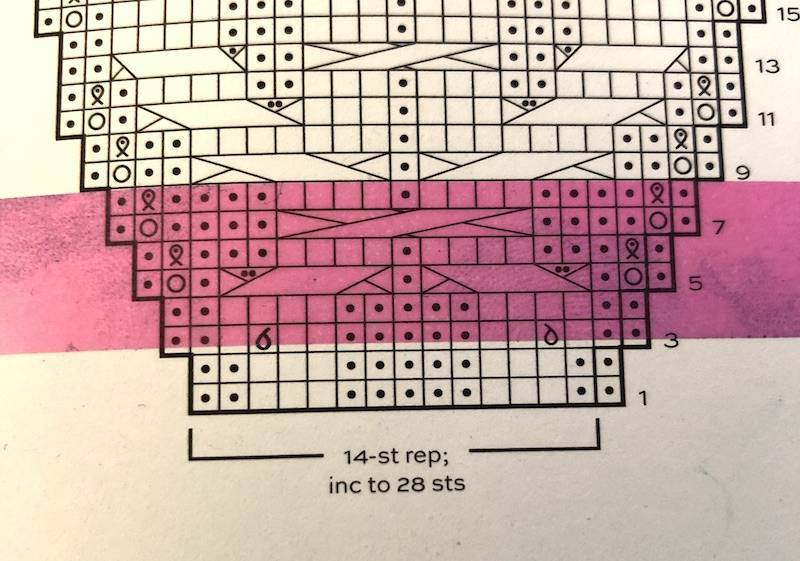 No need to keep track of rows on a chart, and so easy to knit while on the bus, airplane, or other places where managing a chart is awkward. Kay, I also like the highlighter tape. One more tip I use to save even or tape. I up my chart on a index card using transparent tape. all across the chart. Then the chart is all covered and none of the ink come off on the index tape making it last longer.